It was taken by Sam Lakeman on a beach in County Donegal in the very North West of Ireland. It is called "Kinnego Bay". I heard that it is a very beautiful place and not easy to get to, and Cara and Sam try to visit when they get the chance. 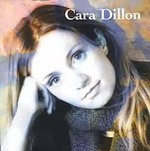 For Cara Dillon's fans, this debut album had been truly long-awaited. Since Cara Dillon and Sam Lakeman left Equation to pursue their own music, they have been gradually writing and recording their debut album. Over the past 5 years from 1996, although they have faced the many difficulties, one of the best albums of 2001 was completed. Almost all of the songs are traditional but there is lightness of touch that is owing to the good arrangement by themselves, especially Sam Lakeman's piano accompaniment goes well with her beautiful voice. So this album is very accesible also for the people who would not normally listen to traditional folk music. No matter how often you listen to this album, it always charms you.